Tulloch had changed the going this morning to Good to Soft (Grand National Course) and Good to Soft, Good in Places (Mildmay & Hurdle Courses), which means that the courses have reverted to yesterday's descriptions. He said: "It started off a dry day, but then we had steady drizzle until about 1pm - a couple of millimetres of rain. It's lovely ground; just a fraction easier on the Canal side. The Mildmay & Hurdle tracks are Good to Soft today, but it wouldn't surprise me if we had a bit of Good back in it by the time we start racing tomorrow. "Everything is looking great and I'm looking forward to the meeting starting. "The forecast does look a bit unsettled for tonight, with some showers around. Tomorrow's forecast is for showers again, and then Friday and Saturday are predicated to stay quite cool, with possibly the odd shower but fewer of them." Asked whether watering was on the agenda, Tulloch said: "We will see how the ground rides. As always our policy here is to provide safe jumping ground on the easier side of Good, and we are set up to water overnight if we need to do it. "We have made a big investment in all the equipment and the pop-up system that irrigates the Grand National course." "Only the fences can beat him," declares Cheshire trainer Joe O'Shea when summarising Road To Rome's bid for tomorrow's £45,000 Randox Health Foxhunters' Chase (4.05pm). 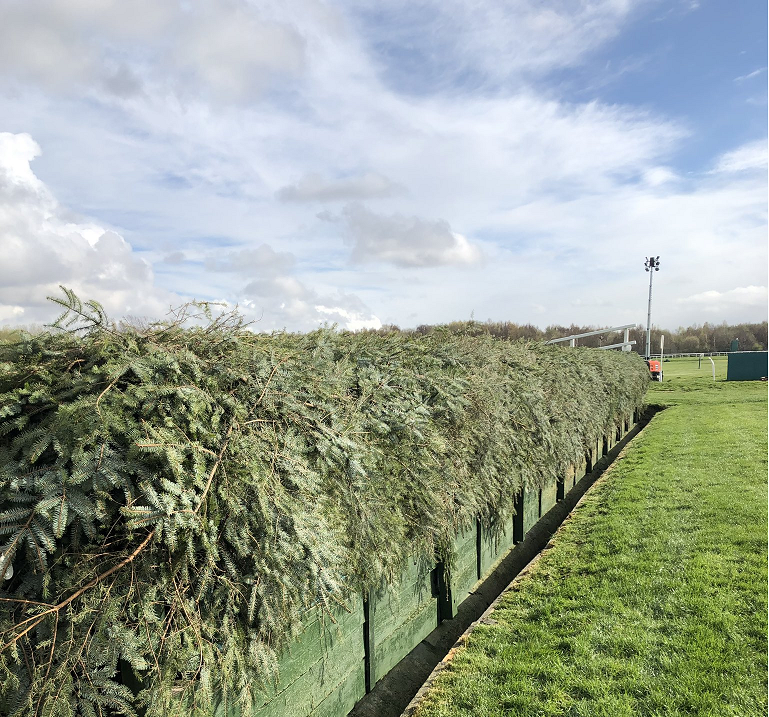 Nine-year-old Road To Rome, 4/1 favourite with Aintree's official betting partner, Betway, is among 27 runners for the race, the first to be run over the famous spruce fences at this year's three-day Randox Health Grand National Festival. It is restricted to amateur riders and horses who, this season, have been running in point-to-points and hunters' chases. The mount of Aintree's leading amateur rider Sam Waley-Cohen, Road To Rome vies for the position of market leader with Burning Ambition (5/1), one of five contenders from Ireland. They include Balnaslow (14/1), first past the post in last year's race. Road To Rome was a maiden when the British point-to-point season kicked off in November, but broke his duck on the opening day at a meeting in Devon, followed up with two more pointing victories, and then won four hunters' chases in a row. His owner, Graham Briscoe, is head of Briscoe's Dairies, which delivers milk to 6,500 homes around Chester. His ambition when buying the horse privately was to win a maiden race, yet his purchase proved easily good enough to run in Cheltenham's St James's Place Foxhunter Chase at the Festival. There he attempted to make all the running, but, as O'Shea feared, the final climb proved too much and he surrendered the lead heading to the final fence before finishing fourth. Top Wood (14/1) finished one place in front of Road To Rome at Cheltenham, and he is also in tomorrow's line-up, where he will be partnered once again by Tabitha Worsley. She will wear the colours of Johnny Weatherby, head of the family firm of racing administrators, and The Queen's representative at Ascot. Trainer Kelly Morgan says of Top Wood: "I chose not to school him over spruce fences. He's not a bad jumper at home, but he jumps so much better when his blood is up. I think the trip will be fine, and the fences will make it more of a test. I was pleased to hear Aintree has had rain." Asockastar (50/1) represents the two-horse string of owner/trainer Daniel Bourne, a self-employed ground worker whose horse was eighth at Cheltenham. Bourne, who has booked Patrick Mullins to ride Asockastar, says: "I'm excited and nervous - I've never been to Aintree, but I've been watching races over the National fences on TV since I was a kid. It's amazing to think I'm going there to run a horse. Asockastar jumps like a bunny, and when Barry [O'Neill] got off him at Cheltenham he said 'He's a little dude, he jumps well and you could try dropping him back in trip'. He was still tanking along three fences out, and while he was beaten a long way at the finish he should get home at Aintree." The Cheltenham race is run over three miles two furlongs and 70 yards, while Aintree's takes place over two miles and five furlongs. Balnaslow was ridden by Derek O'Connor 12 months ago, but Mark O'Hare takes the ride this time and O'Connor partners Burning Ambition, a winner at Down Royal last month for Pierce Power's stable. Ucello Conti (11/2), who was fifth in the Cheltenham Foxhunter, has participated in three Randox Health Grand Nationals, unseating twice and finishing sixth in 2016. He will be ridden by Jamie Codd, and Barry O'Neill partners that horse's Gordon Elliott-trained stablemate Kruzhlinin (15/2), who was tenth in the 2014 Grand National. Bear's Affair (16/1), who was second in last year's race, bids to provide Shropshire trainer Phil Rowley and rider Alex Edwards with a famous Foxhunter double - they won last month's Cheltenham version with Hazel Hill - while Greensalt (25/1), who finished third, one place behind Bear's Affair, is back for another crack at the race under Will Easterby. Dineur (25/1) won the 2017 running of the race - he will be ridden by Peter Bryan, cousin of the horse's trainer, Mickey Bowen, while Guy Disney, who completed the course on Gallery Exhibition (100/1) last year, is back for another spin on the same horse. Disney made history in 2017 when becoming the first leg amputee to ride a winner on a licensed course, having been the victim of a grenade blast while serving in Afghanistan. Six-time British point-to-point champion Will Biddick rides Wonderful Charm (14/1) for trainer Paul Nicholls, and David Maxwell, who leads the table of hunters' chase winning riders this season, partners Road To Riches (16/1). The last-named horse finished a respectable sixth in last year's Randox Health Grand National, and was third to Coneygree in the 2015 Magners Cheltenham Gold Cup. Among riders who have yet to face the National fences is Emma Todd, who rides Shimla Dawn (50/1) for Yorkshire trainer Christine Drury. Todd, who won on the horse at Musselburgh in February, says of her mount: "I've been riding him every day for the past four or five years. He's very special - I love him. The trip and track should be right up his street. I'm getting nervous, but am really looking forward to it." Don Poli and Outlander, two horses who are guaranteed a place in the line-up for Saturday's £1-million Randox Health Grand National, will be offered for sale at Aintree tomorrow after racing. Trained by Gordon Elliott, and currently in the ownership of Gigginstown House Stud's Michael O'Leary, the duo are among 29 horses who form the catalogue for the Goffs UK Aintree Sale, which takes place at 5.45pm. Racegoers who opt to stay for the auction will not wait long to see the pair come under the hammer, for they are Lots 1 and 2. Don Poli was pulled up in last year's Randox Health Grand National, but the 10-year-old's career highlights include a third-place finish in the 2016 Magners Cheltenham Gold Cup, and a victory over Aintree's Mildmay Chase course in December 2015, when Grand National winner Many Clouds finished second. He is set to be ridden by Patrick Mullins on Saturday, while Keith Donoghue is due to partner 11-year-old Outlander, who beat Don Poli in the G1 Lexus Chase in 2016, and the following year won Down Royal's G1 JNwine.com Champion Chase. Both horses are currently 80/1 shots for the big race with Betway, Aintree's official betting partner. The remainder of the catalogue comprises young horses who have run once or twice and shown some merit in Irish or British point-to-points, plus a handful of bumper performers. Graduates of the sale who have gone on to become stars of racing under Rules include last month's G1 RSA Chase winner Topofthegame, who was sold for £120,000 at Aintree in 2016, and Samcro, who headed that year's sale with a valuation of £335,000 and later won the G1 Ballymore Novices' Hurdle at the Cheltenham Festival. Topofthegame is among entries for Friday's G1 Betway Mildmay Novices' Chase. Vandemere (Lot 4) and Grandads Cottage (Lot 15) won for Donnchadh Doyle's Monbeg Stables on Sunday, when Pens Man (Lot 6) and Glynn (Lot 28) scored for trainers Sam Curling and Stuart Crawford respectively. Four British pointers are due to walk the ring - all four-year-olds who won their most recent start, they are The Composeur (Lot 8) and Bird On The Wire (Lot 19) from Phil Rowley's stable, Get Prepared from the yard of Michelle Offen, and Staithes, who is offered by owner Tom Lacey. Turnover at last year's Goffs UK Aintree Sale achieved a sum of £2,417,000, while the average price was £115,095. A special passenger among the Elliott draft was the 2007 Randox Health Grand National winner Silver Birch. He has come across the water to participate in the Parade of Champions, which takes place on each day of the Randox Health Grand National Festival, (April 4 - April 6).